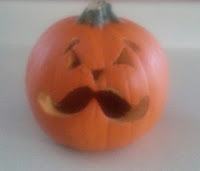 Hello everyone, happy Halloween!! Hope you all had a wonderful time trick-or-treating or giving out candy. It’s always fun to see the children get into character in there costumes they look so adorable. 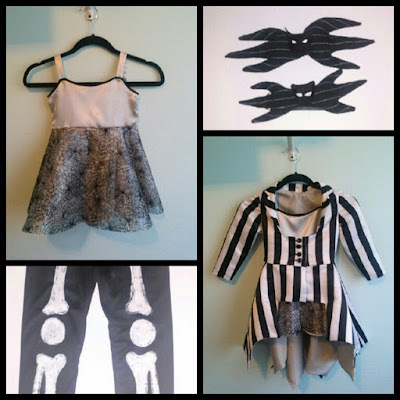 Talking about children as I mentioned in the previous post I had the privilege of designing two Halloween costumes one for a little girl and the other for a toddler. This is my first time designing for a small person; it was so much fun and the patterns where super tiny. They both wanted to be Jack Skellington from the Nightmare before Christmas. For the Toddler we decided to keep it original and close to Jack’s character. He would have a basic white button shirt, with a pinstripe suite and his bat bow tie. The back of the suite would have the tails flaring out just like Jack. I really wanted to make sure I found the right pinstripe because I was trying to stay away from looking like your ordinary suite. 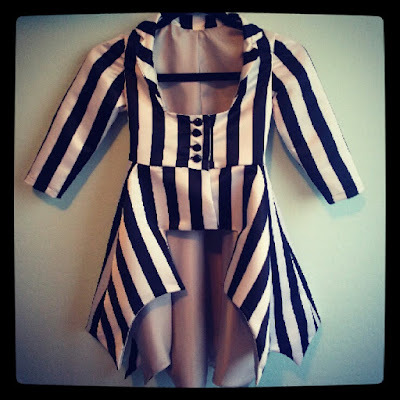 This pinstripe fabric was perfect because it captured those imperfect stripes and made it look more like Jack’s suite. 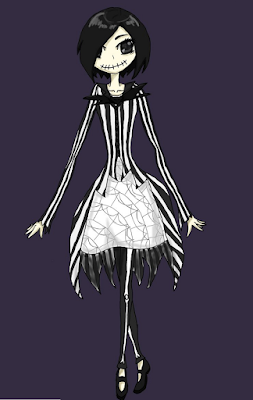 Here is the completed costume; it is super adorable I am happy with the end result; I managed to capture Jack’s character. When he tried it on he looked like a sharp dressed lil man. His mother was super excited and happy with the costume. Don’t need a reason why. 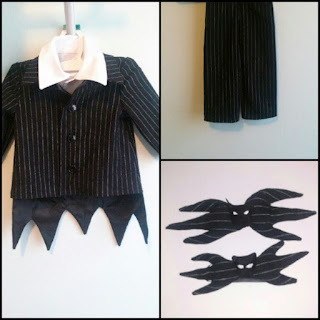 Here is the tiny costume for the toddler, love the tail and bat bow tie; these are the elements that make up Jack. For the little girl’s costume we decided we would be inspired by Jack’s character and make it super girlie. However, it will still have some important elements, such as the pin stripe jacket with the tails and the bat bow tie. The costume would consist of a dress, jacket, gloves, bat bow tie and leggings. 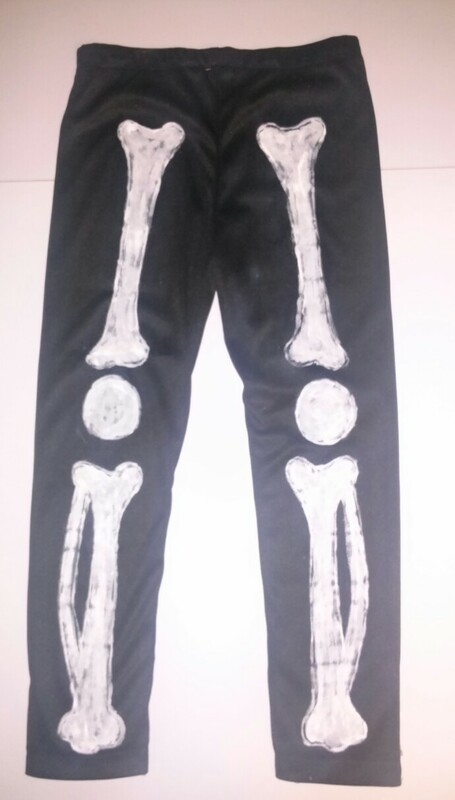 Now the leggings where going to have skeleton bone design, the design would be hand painted. Here is a picture that the mother provided as inspiration. The fabrics consisted of bold stripes, spider webs, and glitter satin. I pretty much wanted to keep it as close as the graphic picture. Here is the completed costume; it was super girlie and very unique. 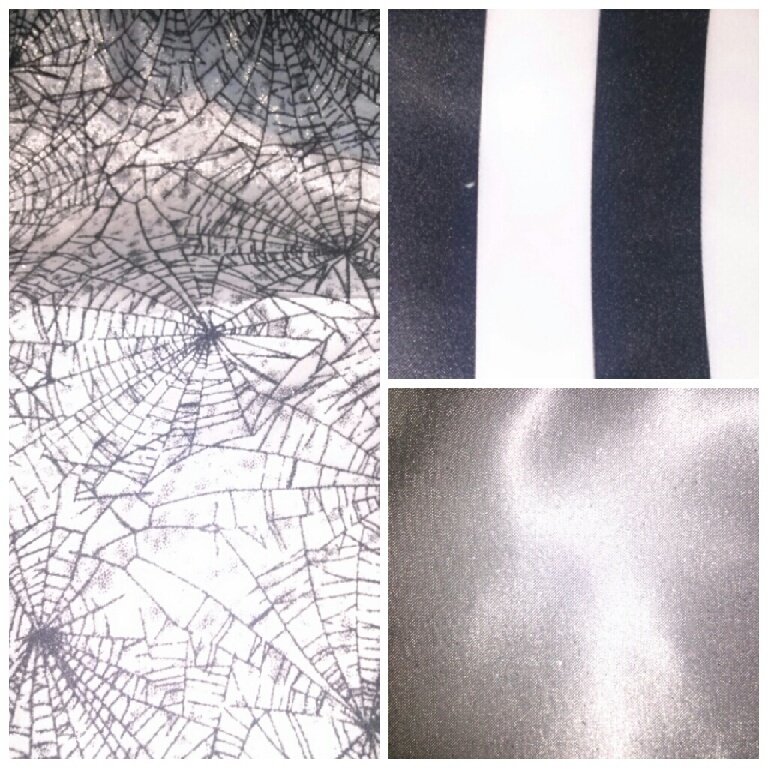 I love the fact that I was able to mix and match fabrics while making them go together it looked very interesting. The leggings became a special piece because they where hand painted and that was something to really appreciate. Who can say that they own a pair of custom design leggings with hand painted print? 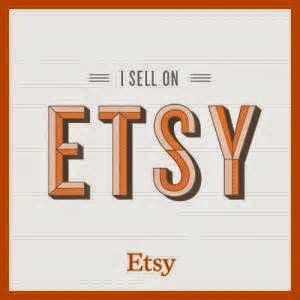 (Am I right?) When she tried it on she was ecstatic, she loved everything about it. Her mother was amazed at how close I kept it to the initial inspiration. Overall I was super happy with the costumes and very thankful that the mother contacted me to make such ambitious and fun costumes. They will definitely turn heads when they go trick-or-treating. 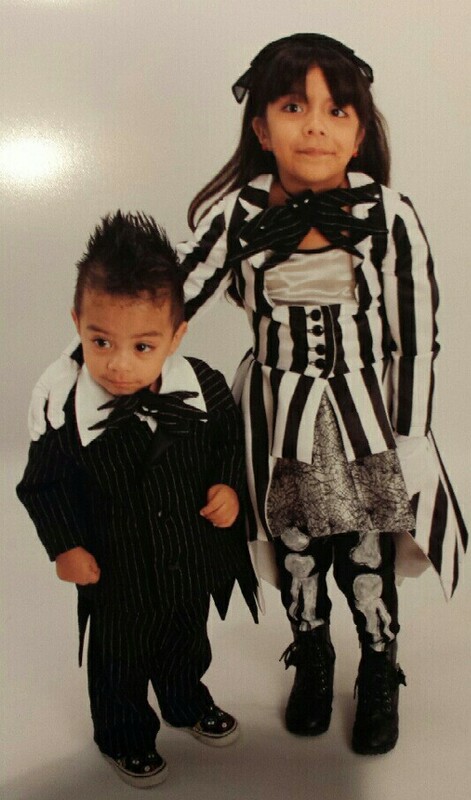 As promised here are pictures of the kids wearing their costumes they look awesome!!! Happy Halloween everyone, and this concludes 2013 Halloween edition hope you enjoyed the costumes. Which costumes did you like out of the three?